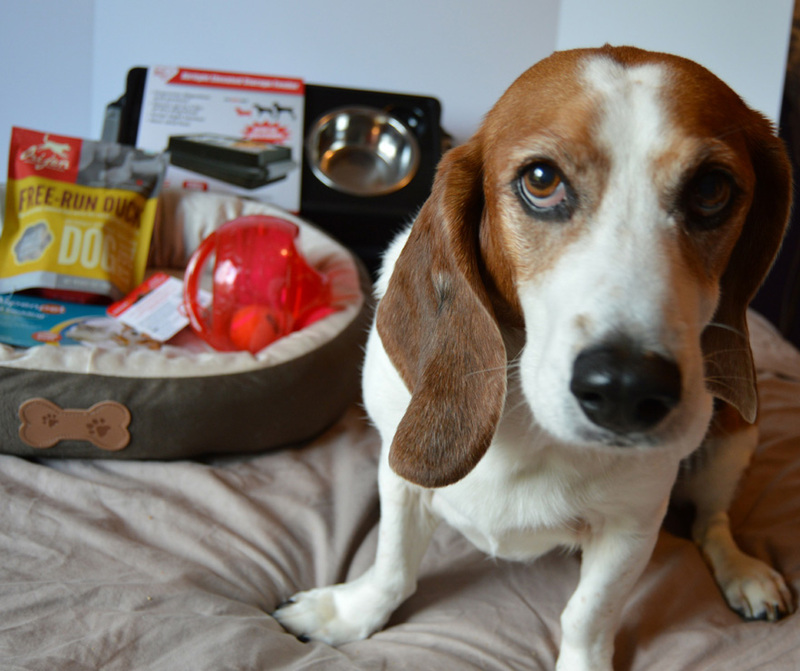 Hope you have had a chance to check out the five prize packages in our first annual Holidays, Hounds and Hot Buys Gift Guide & Giveaway #houndsandholidays! The giveaway launched November 25 and runs through December 9. You can enter on each of the participating blogs – Sarcastic Dog, The Broke Dog, My Life with Dogs, A Dog Walks into a Bar, Denise’s Dog Dish and here on The Daily Pip – for more chances to win. We have five giveaways based on different themes with prizes valued at almost $2,000. Ruby has the most important job of reviewing the Treats & Food Prize Package valued at $300 – it’s a tough job but some dog has to do it! Barkworthies’ Elk Antlers are naturally shed by animals in the wild and feature a tough, tooth-scrubbing exterior and a chewy marrow interior dogs love. The chews are packed with beneficial vitamins and minerals, like zinc, calcium, and iron. They are also 100% digestible as well as additive, chemical, preservative, and odor free. Because of her rough start in life, Ruby’s teeth are not the best. We adopted her at age 7 or 8 and the damage had already been done. She tends to shy away from treats that are too tough to chew – it’s like she doesn’t quite have the confidence to tackle such big projects. And so I was pleasantly surprised to find that she LOVED Barkworthies Elk Antlers. The antler chew was the perfect size and texture for her and she tackled it with gusto! Barkworthies is committed to providing premium natural dog treats and chews. Their treats and chews are all completely digestible, free of preservatives, chemicals or additives and most of their products contain only one ingredient. Although not part of the giveaway, Ruby also loves and recommends Barkworthies Sweet Potato Chips. Caru Soft ‘n Tasty Baked Bars are all natural, non-GMO ingredients, anti-biotic free, formulated without artificial colors, added hormones, animal by-products, or preservatives as well as grain, gluten, corn, and soy free. Each bar is packed with high quality protein for strong muscles and a healthy heart along with blueberries and cranberries for added vitamins and minerals. Additionally, these products are carefully prepared in small batches and naturally preserved. Ruby sampled Caru Soft ‘n Tasty Baked Duck Recipe Bars. Initially I thought they might be too big for her (I am a bit over-protective), but she managed quite well and absolutely loved them. Caru Soft ‘n Tasty bars are available in beef, chicken, and duck. Caru also makes Soft ‘n Tasty Baked Bites in a variety of flavors. These tasty treats received the 2016 Editor’s Choice Awards by Pet Product News. Chewy is an online retailer of pet food and other pet-related products based in Florida. With over 500 brands, awesome customer service and fast, free delivery, they offer one-stop shopping for all your pet’s needs. Chewy also has an amazing blogger outreach program and offers a variety of items for review each month. KONG Jumbler Ball Toy is a two-in-one ball toy for twice the interactive fun. The interior tennis ball and loud squeak entice play, while the handles make pickup and shaking easy. The Jumbler stands up to tough play, making it ideal for games of fetch. The Aspen Pet Oval Bone Dog Bed has raised sides to help promote the nesting instinct and reduce exposure to drafts. Filled with high-loft, recycled polyester fiber fill that is super comfy and machine washable for easy care. Orijen Black Angus Beef Singles Freeze-Dried Dog Treats provide a simple and pure way to reward and nourish your dog with the natural taste he loves. These unique treats are loaded with 100% pure and natural free-range Black Angus beef that’s gently freeze-dried to keep your dog healthy, happy and strong. IRIS Elevated Feeder with Airtight Food Storage will improve your pet’s digestion and help reduce neck strain. These elevated feeders also incorporate convenient storage capacity to keep food fresh with an airtight seal and snap-tight latches. Perfect for indoors, outdoors, camping, and traveling. Ruby will be back on Monday with the second part of her review of #Houndsandholidays Treats & Food Giveaway. Join the fun and enter the giveaway here. Tune in Friday for a Feline Friday Flash Giveaway by Rosie! What a great giveaway! Thanks for letting us know!! Thanks for this info. We will check these out! Ruby, you are one lucky puppy (and you seem to know it too)! I am pretty sure Ruby got the best job! My dogs have tried most of those treats and love all of them. Wow! What an impressive giveaway you have going on. Love the photos. Great loot! Looks like quite a catch! Thank you for including the pic of sweet Sherm – he looks really sweet in this pic and meanwhile he's trying to eat the cookies in my pocket… so many awesome treats in this review and giveaway! Love your pics. We love Chewy – and that is quite the assortment of wonderful treats and toys! I think any dog would love this lot for Christmas! I think words like 'spoiled' and 'pampered' come to mind LOL!!! What a great giveaway for the holidays. We agree that Chewy is wonderful. All I can say is, I'm glad my dogs can't read! Ruby is one lucky dog! Did she enjoy her job? Ruby's got a great life as a tester! Ruby looks super pleased with all of those treats!